This is probably my favorite piece from the show. 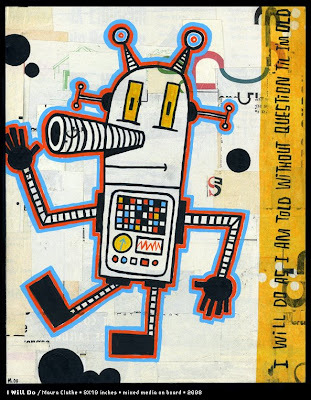 I liked the phrase "I will do what I'm told without question 'til I'm old" so much that I decided to focus on that and simplify it a bit by matching it up with a single robot. Compared to the amount of drawing and doodling in the other pieces in the show, this one is very simple but I think that's part of what I like about it. I've definitely got robots on the brain! Haha! I created the background by layering scraps of paper I saved and then mixed 'em up with a printed piece of scrapbook paper that I picked up from Archiver's. This is also the first time I've used Golden Acrylics - wow, they're great! I think I need to go pick up some more.